Water thinnable acrylic enamel creates rapidly drying, smooth, stylish coats with a uniform sheen or soft sheen. The coats are resistant to sticking, UV radiation and weather. Enamel coats are both hard and flexible, water-resistant and resistant to mild household cleaning agents. 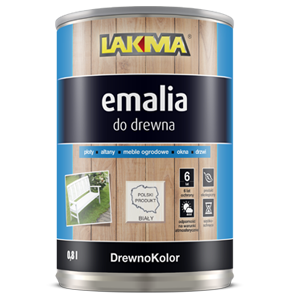 Primarily for painting wooden surfaces both inside and outside buildings, in particular for wood panelling, furniture, window frames, internal and external doors and garden furniture. Can also be used to paint dados on mineral substrates and for painting standard and structural wallpapers. May be also used on steel surfaces protected beforehand with water thinnable anti-corrosion base coat.